About two months ago, Intel unveiled a major change in their computing platform which would serve to be the stepping stone for greater things to come. So huge was the change that a lot of hardware we've come to know has undergone a significant overhaul, whether in technology or form factor. The change was necessary as it was seen in the industry as a much needed evolution of technology, as well as to keep up with the computing needs of today. If you're still clueless at this point, we're actually talking about Intel's latest range of Alderwood and Grantsdale platforms which has been designed to embrace the latest technologies like PCI Express, DDR2 and a whole lot more of useful features for the digital home usage model. With an influx of new hardware coming into the market right now, we know a lot of DIYers are unsure of what to do with these new standards in hardware technology. However, fret not as we've quickly whipped up our next DIY guide for those willing to take the plunge into the unknown and be one of the early adopters of these exciting technologies. If you want to know more about the new platform, you should check out our recently published Alderwood article . Along with new technologies like PCI Express and DDR2, Intel has also updated their CPU socket form factor to what is now known as LGA775 (LGA is known as Land Grid Array) or Socket-T. This is basically a new silicon packaging technology which does not incorporate any pins. In fact, the processor is so well packaged that it is virtually impossible to damage it by poor handling techniques. This is because the processor does not come with any pins and unlike the older Socket-478 packaging, there are no pins for you to break. So, how does one install a processor like that? That's what we'll discuss in this guide, along with all the important tips and tricks you'll need to keep in mind in order to successfully build your first high-end system. 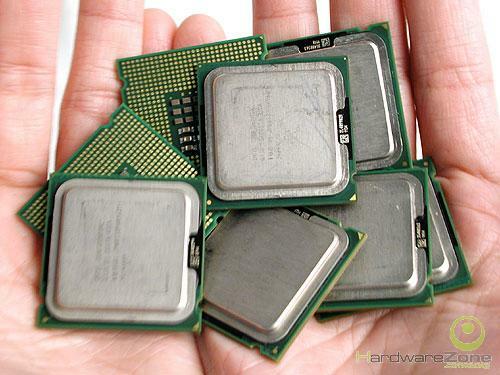 Intel Pentium 4 processors with the new LGA775 packaging. Before we begin, let's run through some of the available LGA775 processors available from Intel. Note that the list here is not exhaustive since Intel will release new processors from time to time. What is provided in the table below is correct at the time of publication. * Pricing indicated for 1,000-unit tray quantities. Correct at time of publication.